Let me start this spoiler-free review by saying that I had extremely low expectations for this movie. I don’t read reviews before I see a movie, but I’d seen headlines, and I was prepared for this to be the utter destruction of my childhood. I was…pleasantly surprised? 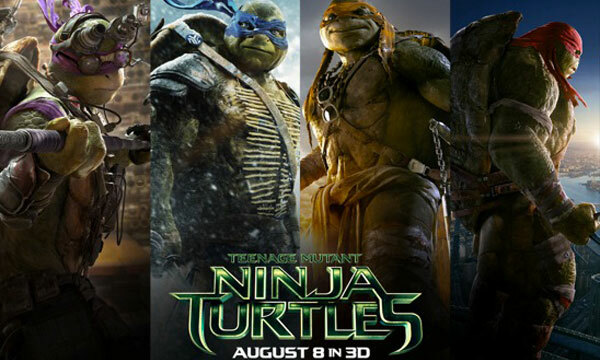 Teenage Mutant Ninja Turtles, directed by Michael Bay, was a poorly written but entertaining movie, and my childhood survived with only a few bruises. It’s a modern reboot of the 90s cartoon show and movies, though thankfully goes more for “campy” than “gritty”. In this reincarnation, the turtles and their rat father figure/sensei Splinter were lab animals. An experiment with some alien goo turned them into grotesque parodies of their canon personalities. Leonardo, always the leader, is quiet and stoic and has very few lines. Rafael has gone from broody rebel to nine-foot-tall hulking brute whose secret is that he’s always angry. Michelangelo, no longer a California surfer, is now a keyboard-cat-loving dudebro, which is surprisingly endearing. And Donatello—oh Donny. Donny, Donny, Donny. What did they do to you? Donatello, instead of being the quiet, bookish brother who I had a crush on when I was ten, is a gangly mouth-breathing hacker nerd with taped glasses and a penchant for speaking like nerds do in movies but no sentient being has ever spoken in real life. I cringed every time he was on the screen. April O’Neil, played by Megan Fox, was a disappointment. She’s a hot but expressionless news anchor who’s always doing fluff pieces but dreams of being an investigative reporter. Her idea of “investigative reporting” is doing an ill-conceived Nancy Drew impression and getting in trouble a lot. At one point she sneakily takes pictures of a crime in progress, except that she has the camera turned around backwards and is actually taking pictures of her own face. I don’t think that was in the script. The plot was too stupid to talk about, so let’s skip that part. Ultimately, it was enjoyable, especially once it got away from April’s search for a real news story and focused on the turtles. They had some funny moments, and you got the impression that they really had grown up with only each other for company. Their interactions were the best part of the movie, and are what saved the movie from being utter drivel. The fight scenes seemed to take place in an oddly frictionless environment, but they were exhilarating. I enjoyed seeing the turtles in the modern world, talking about watching Lost and doing Nolanverse Batman impressions. I wish there had been some character development—literally the only character development in the entire movie was Rafael learning the same lesson he learns in every single movie, which is that he’s a follower, not a leader—but that seems to be too much to ask for action movies these days. I’d rank it far below every other TMNT movie (yes, even Turtles in Time) but I might consider adding it to my collection someday, just for the sake of nostalgia. I’d give it 3 stars out of 5, though that includes half a star for the theme song cameo at the end of the movie. Don’t watch it in theaters. Wait for it to come out on Netflix and keep your expectations low, and you’ll be fine. This entire story has been such a mess that it’s really hard to know where to begin. It would be nothing more notable than two massive corporations vying for supremacy if there wasn’t this bizarre rhetoric about holy wars and oppression surrounding it. Hachette versus Amazon has come to symbolize the larger war of self-published authors (or indie-pub or author-pub or whatever terminology you want to use) against traditionally published authors, and the old guard versus the new upstarts. July 2012: Apple is found guilty of colluding with big publishers, including Hachette, to set ebook prices higher than Amazon’s usual $9.99 price tag. As part of their punishment, the publishers involved are forced to renegotiate their contracts with their retailers, including Amazon, and are no longer allowed to set their own prices for two years. In other words, Amazon can discount their ebooks to their heart’s content and the publishers can’t do much about it. A fitting punishment, really, since the publishers did commit a crime. Early May, 2014: The contracts from the anti-trust agreement are due to expire. Hachette is the first publisher to start negotiating with Amazon again. Amazon, which controls 50% of the book selling market, wants to continue to sell Hachette’s ebooks at a discount. Hachette refuses. In retaliation, Amazon starts pretending all books published by Hachette are out of stock and will take 2-4 weeks to ship. It also recommends other, lower-priced books to customers on Amazon, and stops letting readers preorder Hachette books. Many Hachette authors see their sales plummet. Here’s Stephen Colbert on the dispute. (Side note: I don’t watch television, so it’s only in watching that video that I realized Hachette isn’t pronounced ‘hatchet’). Late May: Amazon finally issues a statement, and offers to establish an “author pool” to give Hachette authors some of the money they’ve been losing, as long as Hachette agrees to cover the other half of the cost. In other words, Amazon punched a bunch of authors in the face, then said they’d only give them some ice if Hachette helped pay for it. Hachette looks bad if they don’t help their authors, but it’s admittedly Amazon who punched the authors in the face in the first place. Hachette responds, saying that they’ll agree to compensate the authors hurt in the deal once Amazon and Hachette have come to an agreement about the pricing. Still, Amazon doesn’t mind a little bit of a tarnished reputation as long as this strategy works. If Hachette gives in, then each subsequent publisher whose contract comes up for negotiation is more likely to give in, since they’ll have seen what damage Amazon can do. The more publishers let Amazon control the prices, the more Amazon will control the entire market, and eventually publishers themselves will start going bankrupt, which—since Amazon is, of course, a publisher as well—means Amazon will benefit financially. Amazon asks Hachette to give 100% of book revenue to their authors. Hachette refuses, calling that suicidal. Amazon accuses Hachette of using their authors as meat shields. Early August: Hachette author Douglas Preston asks Amazon to stop bullying authors. 900 authors sign on, and a full page ad is scheduled to run in the New York Times tomorrow (Aug 10). Today: Amazon sends a letter to their Kindle Direct Published authors, asking them to join the battle. They ask their authors to email Hachette’s CEO, and to cc Amazon on the email. They mention many of the events listed above. It’s weird in many ways, but to me, this is the weirdest: the readersunited.com domain on which they published that letter was registered 18 months ago. Yes, that’s right, a good 14 months before this brouhaha even started. (Though I’m not sure when, exactly, Hachette and Amazon began negotiating in private). So, uh, I’m not sure what to make of that. Phew, that took far too many open tabs to compile. Long story short, this struggle between Amazon and Hachette is a key battle for power in the publishing world. If Hachette wins, Amazon loses a bit of its power for a little while longer. If Amazon wins, it’s possible that it will kick off a slow decline into bankruptcy for not just Hachette but all the big publishers. As for my opinion on the matter? I don’t want Amazon to be a monopoly. They might have low prices now, but that won’t necessarily be the case once they’re free from competition. Also, I don’t think it’s too much to ask readers to pay more for their book than they’d pay for a Starbucks latte, since the former took a little more effort to make.